Integrated Medical Analytics Technology (IMAT) provides solutions for difficult problems and exciting opportunities with medical data. IMAT enables healthcare communities and organizations to unlock the value of their medical and claims data through comprehensive data management, reporting, community engagement, and analysis. Much of the medical industry is struggling with accessing and managing data, facing issues such as understanding how much and what kind of data is stored, ensuring data is complete and consistent, and finding and viewing each piece of data. IMAT provides a powerful workflow for working with data. It can connect, collect, and transfer data from virtually any data source. After the data has been aggregated, IMAT normalizes, cleans, transforms, and stores the data in a proprietary search index. IMAT works with major medical data formats such as HL7, CCD, XML, and CSV and with various structured and unstructured record types such as ADTs, labs, notes, and claims. Once data is in the system, IMAT provides reports for verifying the data is complete, valid, and consistent. Users, groups, and data collections are tied to its security model, allowing for global and granular access control and security. IMAT’s patented search technology allows for each record to be accessed and displayed nearly instantly. With IMAT, data becomes accessible, secure, and manageable. Many of the most exciting opportunities and important government mandates are focused on medical reporting. IMAT offers a growing library of standardized reports including eMeasures, AHRQ, PQRS, HEDIS, and NQF reports. If the needed report is not in the library, an organization can use IMAT’s report building tools to write the query or IMAT’s team can implement it. Some of the most effective methods for improving healthcare require healthcare communities to work together to track, treat, and support patients, both individually and as populations. IMAT includes a consolidated patient chart for displaying a holistic view of a patient’s data and shared dashboards, scorecards, and reports. Combined with IMAT’s security model and the ability to verify consent status, IMAT provides a powerful toolkit for managing community health and engaging members of the healthcare community. The medical industry has only begun to realize some of the benefits of working with data at a large scale. There is massive untapped potential in analyzing aggregated medical data, including the ability to run predictive analytics and perform research with larger, more accurate cohorts and full populations. IMAT includes tools required to perform deep analysis on medical data, such as a powerful query engine and builder to select and filter data. It also offers a full scripting language with included mathematical, statistical, charting, and graphing plugins to manipulate, display, and examine the data. With IMAT’s powerful and integrated suite of capabilities, healthcare organizations can unlock the value of their medical data today and establish a foundation for solving future problems. To request a demo, please call 1.866.306.4894 or sign up here. 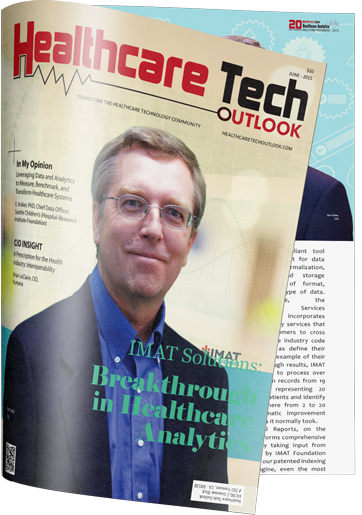 IMAT Solutions is a new, disruptive medical data management and decision support company. Every day, our software processes tens of millions of records to help 31,000 healthcare professionals working for 2,000 Health Information Exchanges, Accountable Care Organizations, Medical Homes, hospitals and clinics to provide the best possible healthcare to almost 20 million patients. Based on patented technology, IMAT has been developed to address the ever more complex and demanding needs of today’s healthcare providers and practitioners. Our product is based on a completely new approach to ingesting, storing and processing massive amounts of structured and unstructured data from EHRs, lab results, physician notes, transcripts, ADTs and letters. This patented design delivers disruptive speed, superior data accuracy, easy to use charting, reports and queries and is highly cost-effective.